What were locations of ancient India civilizations: One of the most significant civilizations which took place in ancient India was the Indus Valley Civilization or IVC. This civilization which took place in the Bronze Age was located mainly in the northwestern region of the Indian Subcontinent, consisting of what is now mainly modern-day Pakistan and northwest India. Flourishing around the Indus River basin, the civilization primarily centered along the Indus and the Punjab region, extending into the Ghaggar-Hakra River valley and the Ganges-Yamuna Doab. Geographically, the civilization was spread over an area of some 1,260,000 sq km, making it the largest ancient civilization in the world. There is an Indus Valley site on the Oxus river at Shortugai and extending towards Alamgirpur on the Hindon river located only 28 km from Delhi, India. The Indus Valley is one of the world’s earliest urban civilizations, along with its contemporaries, Mesopotamia and Ancient Egypt. At its peak, the Indus Civilization may have had a population of well over five million. Inhabitants of the ancient Indus river valley developed new techniques in metallurgy and handicraft like Carneal products, seal carving and produced copper, bronze, lead, and tin. The civilization is noted for its cities built of brick, roadside drainage system, and multistoried houses. The mature phase of this civilization is known as the Harappan Civilization, as the first of its cities to be unearthed was the one at Harappa, excavated in the 1920s in what was at the time the Punjab province of British India which is situated in the present day Pakistan. Excavation of Harappan sites has been ongoing since 1920, with important breakthroughs occurring as recently as 1999. To date, over 1,052 cities and settlements have been found, mainly in the general region of the Ghaggar-Hakra river and its tributaries. 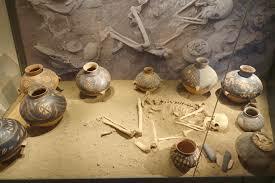 Among the settlements were the major urban centers of Harappa, Lothal, Mohenjo-Daro which has been regarded as the UNESCO World Heritage Site, Dholavira, Kalibanga, and Rakhigarhi. 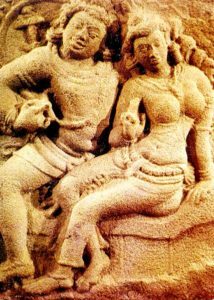 The civilization is sometimes also referred to as the Indus Ghaggar-Hakra civilization or the Indus-Sarasvati civilization. The appellation Indus-Sarasvati is based on the possible identification of the Ghaggar-Hakra River with the Sarasvati River of the Nadistuti Sukta in the Rig Veda, but this usage is disputed on linguistic and geographical grounds. The Harappan language is not directly attested and its affiliation is unknown, a probable relation would be to Proto-Dravidian or Elmo-Dravidian. The Indus Valley Civilization encompassed most of Pakistan, extending from Baluchistan to Sindh, and extending into modern day Indian states of Gujarat, Rajasthan, Haryana, and Punjab, with an upward reach to Rupar on the upper Sutlej. The geography of the Indus Valley put the civilizations that arose there in a highly similar situation to those in Egypt and Peru, with rich agricultural lands being surrounded by highlands, desert, and ocean. Recently, Indus sites have been discovered in Pakistan’s Northwestern Frontier Province as well. Other Indus Valley Civilization colonies can also be traced in Afghanistan while smaller isolated colonies can be found as far away as Turkmenistan and in Gujarat. Coastal settlements extended from Sutkagan Dor in Western Baluchistan to Lothal in Gujarat. An Indus Valley site has been found on the Oxus River at Shortughai in northern Afghanistan, in the Gomal River valley in northwestern Pakistan, at Manda on the Beas River near Jammu, India, and at Alamgirpur on the Hindon River, only 28 km from Delhi. 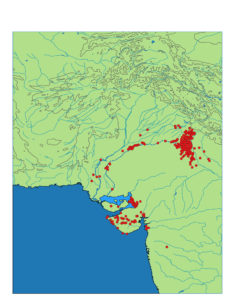 Indus Valley sites have been found most often on rivers, but also on the ancient seacoast, for example, Balakot, and on islands, for example, Dholavira. There is evidence of dry river beds overlapping with the Hakra channel in Pakistan and the seasonal Ghaggar River in India. Many Indus Valley or Harappan sites have been discovered along the Ghaggar-Hakra beds. Among them are: Rupar, Rakhigarhi, Sothi, Kalibangan, and Ganwariwala. 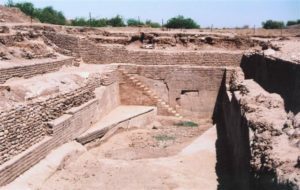 According to some archaeologists, over 500 Harappan sites have been discovered along the dried up river beds of the Ghaggar-Hakra River and its tributaries, in contrast to only about 100 along the Indus and its tributaries; consequently, in their opinion, the appellation Indus Ghaggar-Hakra civilization or Indus-Saraswati civilization is justified. However, these politically inspired arguments are disputed by other archaeologists who state that the Ghaggar-Hakra desert area has been left untouched by settlements and agriculture since the end of the Indus period and hence shows more sites than found in the alluvium of the Indus valley; second, that the number of Harappan sites along the Ghaggar-Hakra river beds have been exaggerated and that the Ghaggar-Hakra, when it existed, was a tributary of the Indus, hence the new nomenclature is redundant. A sophisticated and technologically advanced urban culture is evident in the Indus Valley Civilization making them the first urban centers in the region. The quality of municipal town planning suggests the knowledge of urban planning and efficient municipal governments which placed a high priority on hygiene, or, alternatively, accessibility to the means of religious ritual. In sharp contrast to this civilization’s contemporaries, Mesopotamia and Ancient Egypt, no large monumental structures were built. There is no conclusive evidence of palaces or temples or of kings, armies, or priests. Some structures are thought to have been granaries. Found at one city is an enormous well-built bath known as the “Great Bath”, which may have been a public bath. Although the citadels were walled, it is far from clear that these structures were defensive. They may have been built to divert flood waters. Most city dwellers appear to have been traders or artisans, who lived with others pursuing the same occupation in well-defined neighborhoods. Materials from distant regions were used in the cities for constructing seals, beads and other objects. Among the artifacts discovered were beautiful glazed faïence beads. 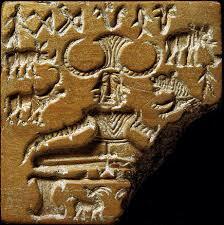 Steatite seals have images of animals, people or perhaps even gods, and other types of inscriptions, including the yet un-deciphered writing system of the Indus Valley Civilization. Some of the seals were used to stamp clay on trade goods and most probably had other uses as well. Although some houses were larger than others, Indus Civilization cities were remarkable for their apparent, if relative, egalitarianism. All the houses had access to water and drainage facilities. This gives the impression of a society with relatively low wealth concentration, though clear social leveling is seen in personal adornments.